Each of the customer you see that lines up in front of JCO has its own story to tell. Just like any of them, I wouldn't waste my time waiting in line for two hours for no reason at all. Yes people! Two hours of waiting and it has no exaggerating words involved. I am a fan of donut and JCo just proved why they're now the latest craze in town. 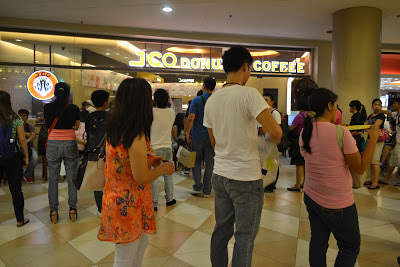 Search for JCo and you will find other people's review over those holed flavored sweet doughnuts. 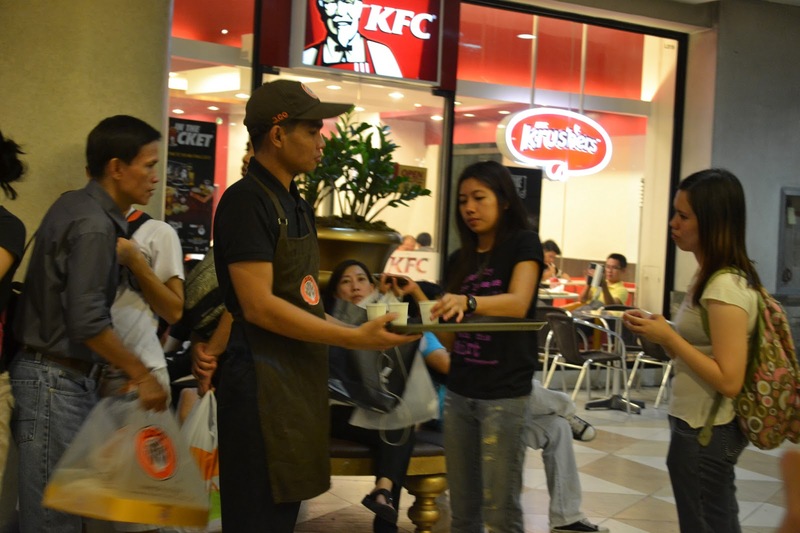 I went to Trinoma to cover MEZZA NORTE event last Friday night. I have been telling my children before that I will buy them JCO donuts when there is a nearby JCO but everytime I see a store with people in a zigzag line, I always find another store instead like KK, NutsGonuts or Dunkin Donuts. 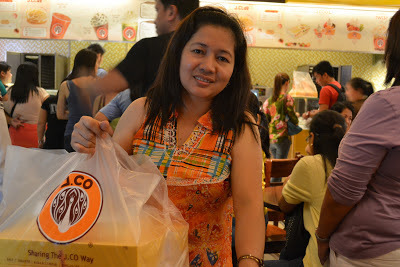 Last Friday, I was determined to get a box of JCO donuts. Why? Read my previous post. Ok, enough for my wordy post. So truth be told. The young man standing before me with a bear stuff on his hand has his own explanation too. For two hours of waiting, I got to know his justifiable cause, enough for him to wait for long hours. That is, to buy donuts for his girlfriend! Ooh. That was really sweet! I wish I could say congratulations to his girlfriend finding such a man so rare today. Oh well, just as how he justified his, two hours for me weren't enough to repay my daughter for accidentally erasing her files. At least to say, I sincerely apologize. and waiting... and the staff gave a glass of water to some of their customers while waiting..and waiting again. I wish that my iPad wasn't disabled that day so I could have used up my time blogging while waiting in a long long line. and still waiting.. An aerial view would have been better to give you an idea how it looked like. I was on the 70th when I arrived. Seriously, no joke. Finally! Yes, finally after two long long hours! I left the store at 10:30 and there was about 50 more people outside waiting. And the staff once asked the customers one by one how many boxes to order to determine and estimate the boxes of donuts they need and how many customers to accommodate. And I asked the staff, "how many more boxes of donuts are available?" He replied, at 10:30pm, "we only have 150 dozens available." It looks like they need to cut down the line and give the last customer to be served a banner that says, "last customer." for the day. So that's my JCo story. What's yours? Wow, congrats sis! I have been to JCo yet. Good luck sa'kin. Gawa nalang ako ng sarili kong donuts sa bahay. 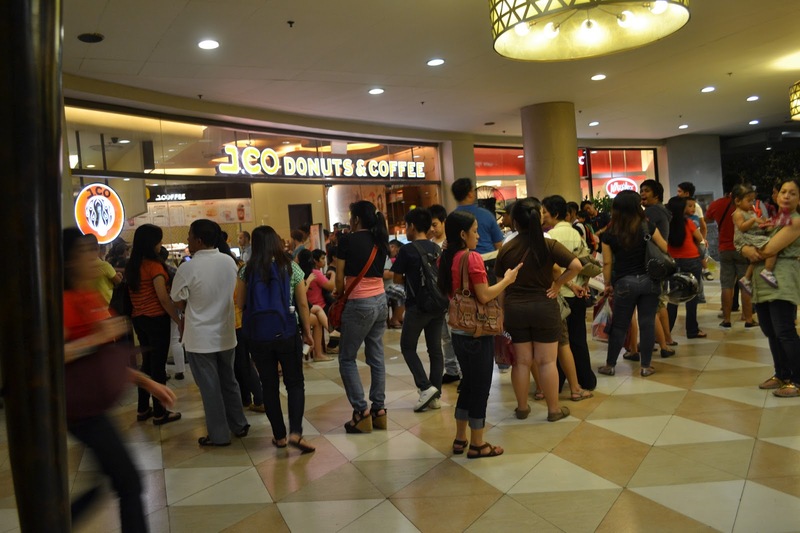 Tiis muna sa lasa until konti na lang ang craze at mas marami ng branch ang JCo. Hahaha! I love J.CO donuts even their beverages! yummy! Just before New Year's eve, I promised to bring home 4 boxes for the entire family and relatives, just like your experience there was a long line and they even told us that they already stopped accepting customers as early as 11am bec they already exceeded the no. of donuts made for the day. It's worth the wait naman! Anyway, I'm sure there'll be more stores to open. i will not wait for 2 hours for a donut but if i accidentally delete john's files, malamang pipila ako kahit 5 hours, hehehe! i'll send you my jco story once done. @Marjorie, thank you sis. you're story is amazing, of course like all of us, for the family go lang kahit ilang oras pa sa pila. it's all worth it naman. grabe tlaga ang J.Co but at least si hubby ko ang pumipila hindi ako. and he's experienced waiting in line for 2 hrs usually and one time for 3 hrs. in Greenbelt branch. but there's really good reasons why people wait in line like this. i can attest sobrang sarap tlaga ng J.Co donuts. people who havn't tasted will say to the people in line that thy're crazy. 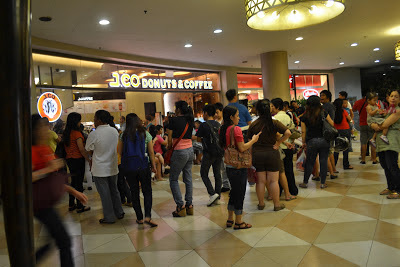 well they're really crazy over the taste of j.co donuts nothing compares tlaga. sorry nobela na tong comment ko. just can't help it hehe. thnx!